Last night’s WEAVE was filled with Sarah’s fantastic marinara sauces (one with meat and one with mushrooms) made from tomatoes picked out of her own garden that day. mmmm, she made dinner awesome. John’s class finished up their discussion of the 7 guidelines Reformed (like Presbyterians) Christians use when reading Scripture. There was animated (and sometimes heated!) conversation about how we interpret life in light of scripture, particularly when thinking of Old Testament passages that seem to condone war and violence and portray a vengeful and violent God, and also how we think about Scripture and Christian ethics in the “minefield” (John’s word) of life. Next week we’ll be having a Colombian dinner and Ann will be telling us about her most recent trip to Colombia–six weeks this summer as an accompanier helping people who have been living with threats against them because of their work for human rights and justice. Join us anytime after 5.45 (dinner buffet starts) for an interesting and tasty South American adventure! This week the read-with-the-pastors book group discussed Missional Renaissance, which talks about a “third way” of seeing the church (the first way being “a place where certain things/holy things happen” and the second being “a vendor of religious goods and services”). This third way is essentially as a missionary society–that the church is the people, wherever we are. So we’re the church at home, at our day jobs, at the playground, at the grocery store, at school, on the freeway, in the voting booth, at the doctor’s office, at the coffee shop or restaurant, etc, and we are a people partnering with God to love the world into wholeness. Last weekend we took a first step (haha!) toward living this idea…with the CROP walk! This year we had 20 walkers from RCLPC who literally took the church out to the street. We also raised $1981! 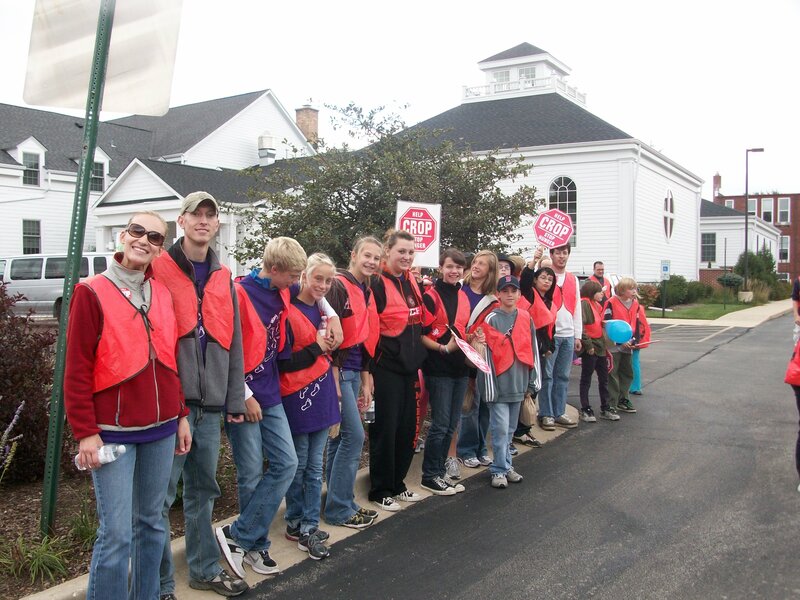 The Crystal Lake CROP walk raised around $11,000 total and had right around 150 walkers. This was a great way for us to help people who are hungry, living in poverty or even in homeless shelters. It was a great way to put our faith into action for 3.77 miles. And it was an awesome opportunity to join feet with people from several different Christian traditions to show the love of God for the world…out in the world! Thanks, CROP walkers and donors! Now let’s take what we’ve learned and be part of God’s mission with every step we take! What pops out at you in this vision/prophecy/poetry/prayer? Is there anything that makes you go “hmm….” or “huh?” or “hey!!! !” Are you reminded of any other stories–whether in the Bible, in literature/movies/music/TV, or in your own life? As you read, do you hear any music in your head? This is a great vision of hope, a poem about what God’s kingdom is like, a vision of God’s future. What do you notice most? Is anything missing from what you would expect in a vision of God’s future or of the kingdom of heaven? If you were to imagine the kingdom of God, is this the kind of picture you would paint? If not–what would be in your picture? How do you see the Kingdom of God coming (or being thwarted) in our time? How do you see the church helping or hindering the coming of the kingdom? How about you personally–how are you a part of the coming of the kingdom, and how are you hindering it? Hope of captives freed, of sight restored, of the end of greed. The oppressed shall be the first to see the year of God’s great jubilee. a vision of God, brought near. the right to hear God’s word and be spiritually fed. Hope of captives freed from chains of fear, want, and greed. We have been released–to faith, and hope, and joy, and peace. What biblical character do you most identify with? why? answer in the comments, or ask new questions in the comments. We’ll answer questions in future Friday posts, and/or post them for the community to answer!